Born on October 18, 1963, Brian Kenny attended St. John's University and the New York Institute of Technology. Prior to joining ESPN, Kenny was Sports Director at WTZA-TV in Kingston, N.Y. for 11 years, where he won 11 New York State Broadcasters Association Awards, along with 5 Associated Press Awards for Journalistic Excellence. 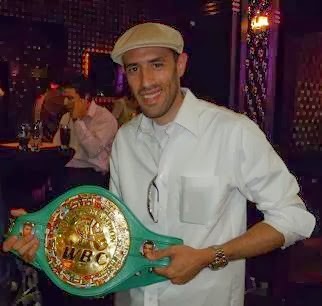 In 2005, Kenny was the recipient of the Sam Taub Award, given by the Boxing Writers Association of America to its Boxing Broadcaster of the Year. Zab Judah returns to action July 16th on "Friday Night Fights" against Jose Armando Santa Cruz. If Judah wins, can he become a major factor again in the junior welterweight division? I've always loved Zab, but it's rare for anyone to drop back to an old weight class and dominate. It's not as if Zab jumped up to a weight class that was beyond his frame - like Shane Mosley going to 154 lbs. There are a lot of young lions at 140, and I don't know if I'd favor Zab against Amir Khan or Devon Alexander. That, by the way, is not such a disrespectful thing - those are 2 of the most complete young stars in the sport. After a magnificent trilogy, Rafael Marquez stopped Israel Vazquez quite easily in the 3rd round of their fourth fight. Did you expect Marquez to look so much sharper than Vazquez? Rafael Marquez has long been one of my favorites. I was definitely surprised by the outcome. I had thought he had gotten the worst of it against Izzy in the 3rd fight, and I thought the whole trilogy sucked the life out of both men. Glad to see a great warrior have that pinpoint precision again, and glad both weren't crippled in the process - they do awful things to the other. Miguel Cotto is a solid fighter, who fought valiantly in brutal knockout losses to Antonio Margarito and Manny Pacquiao. Has Cotto sustained too much damage to be a force in the junior middleweight division? I think Cotto is still a major player at welterweight and junior middleweight. I was ringside for his fight with Pacquiao, and he would've beaten most anyone in the world that night. He wasn't damaged walking in - he came in to WIN. It's just that he faced a total warrior, who was just too fast and too nasty. The first 3 rounds of that fight are an all-time great. With the success of Showtime's "Super Six" tournament, do you see HBO following their footsteps, possibly staging a junior middleweight or junior welterweight tournament soon? The Super Six tourney is fabulous. It's definitely sparked interest, but it takes so long, takes such cooperation, and is so difficult logistically, I don't see it taking hold. That said, I applaud those who put it together. There isn't a bad match-up in the bunch, but again, that takes its toll on the fighters. Tomasz Adamek looked exceptional at cruiserweight, winning impressively versus O'Neil Bell, Steve Cunningham and Jonathon Banks. Now, Adamek has conquered Andrew Golota, Jason Estrada and Chris Arreola at heavyweight. How much of a chance do you give Adamek to defeat Vitali and/or Wladimir Klitschko? Adamek has turned into a very good heavyweight. I did not expect it, but it speaks to where the division is right now that a light-heavyweight champ can jump up post-prime and start beating top ten heavies. Can he beat either Klitschko? No. And no one else can either. Throughout the history of boxing, there have been some stellar, one-punch knockouts. Which one would you rank higher - "Sugar" Ray Robinson's sweeping left hook versus Gene Fulmer in their second fight in 1957, or Rocky Marciano's right hand blow to Joe Walcott's head in their first meeting in 1952? Is there another one you would personally rank higher than both of those examples? The Rock's right hand is the best shot ever. Look back at those clips - Marciano ALWAYS found a way. Yes, he ruled a weak era, but looking through his fights, you realize you cannot dismiss him in the all-time debate. He may have hunted down Ali, or out-slugged a prime Joe Louis. Can't rule it out. I would like to thank Brian Kenny again for taking time out of his extremely busy schedule and granting me this interview. When Brian Kenny is not hosting "Friday Night Fights", you can find him anchoring the 6 p.m. ET edition of Sportscenter, as well as hosting ESPN Radio's "Brian Kenny Show", which debuted in February 2009.